washi bark paper, crafting. Can be made into art, lamp shades. Make money at home. Everyone needs lighting fixtures. and these UNIQUE "WASH I" BARK PAPER as SHADES. WIKI IS ON TOP OF EVERYTHING FINE!! They seem to have covered the WASHI BARK PAPER CRAFT & ART EXPLOSION. When an Ontario canada crafts commune goes nuts using WASHI in different ways, it's a whole new artworld babeeee! WHAT IS WASHI? It seems that many trees not just in Japan have cottony pulp under their bark. 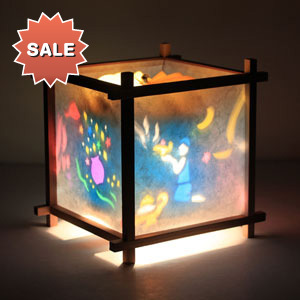 (I just saw an Okayama Japan artisan -master on a TV show and spotted freeform branches arranged in a cylinder form, but all crookedy and bendy, not neat like the one to the left... with this handmade paper inside of their circumferance, all lit up with amber electrical lights. And my Bazaar brain went into a paroxysm of delight.) Many Trees seem to have a pulp in their bark (The list is anywhere you google paper, bark trees, hand made papers.) The pulp is just under the bark, soft, cottony fibres which are boiled into paste which is screeded onto old window screens, (it looked like that on TV,) with a piece of straight lumber. The bark fibres dry on the screen and amazingly suit the manufacture of painted art and also fabrication of light fixture shades that are so gallery artistic, they'd bring in huge revenues. Twigs, branches made into a cylinder small leaves woven into the washi, and an electric light. A lucrative field. Stay at home, make a dynamic living, Go to craft fairs, wholesale to boutiques, decorator's row, which many cities have. Over years of watching washi, I found a Canadian art commune KABOODLE *since disbanded,) which had their very own online, (these are free btw,) crafts blog and auction site ....an art council that sells washi art of all kinds, ONLINE. So Washi has gone InterNashi! THAT whole KABOODLE commune in itself was a mind blower. A group of artists joining for a website. Today, POWWEB.COM offers a 3$ a month webhosting service WITH domain name free. You and ten artisans create your unique name, study MERCHANDISING SECRETS. Start now with your own ETSY SITE! 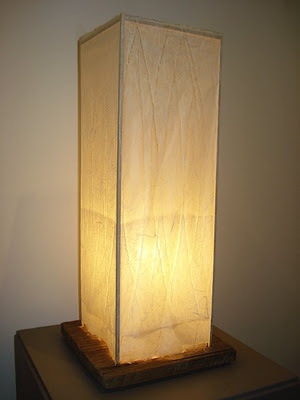 Here is the more typical Chinese lantern, instructions to make them of Washi paper. And you do know, you can make your own paper out of all kinds of things.